← When is the world going to stop China promoting the butchering of animals? Once again we have an idiot who thought the posting of an act of animal cruelty on social media would endear her to her friends. 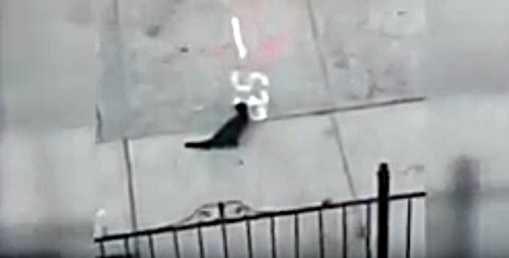 Instead, a 19-year-old woman from Clifton, New Jersey was arrested Saturday after a concerned citizen alerted Newark police on Thursday after a video of a cat being thrown from a third-floor balcony was posted where someone can also be heard laughing in the background. Tikeemah Lassiter was charged with animal cruelty after the video taken in the 300 block of South Orange Avenue went viral, authorities reported. Lassiter had been visiting relatives in Newark at the time of the incident. A $10,000 warrant was issued for her arrest for an assault charge by New Jersey Transit Police. Which goes to show animal abusers also often abuse people as well. Although the cat survived the fall, it was initially immobile on the concrete where it landed. It’s currently in the care of the New Jersey Society for the Prevention of Cruelty to Animals and will be placed in an appropriate home after the veterinarian in charge of care deems it healthy. Don’t abuse animals and don’t abuse animals, post a video of yourself committing the abuse, then expect to get away with it. This is called “physical evidence” and will most likely be used in court to gain a conviction. Never mind….go ahead and post. Give your name and phone number and include a map to your home if you wish. I wonder how many friends Tikeemah has lost since posting her video? That video can be seen below, and is difficult to watch. The photos above showing the abuse were screenshotted from that video. This entry was posted in animal abuse and tagged animal cruelty, cat thrown from balcony, The Articles of Elisa Black-Taylor, Tikeemah Lassiter by Elisa Black-Taylor. Bookmark the permalink. These sorts of crimes seem to be mostly linked to those ages that would have, presumably, been my grandchildren’s age, if I had any. What is wrong with parenting that any child would feel entitled to harm any animal? And, yes, I blame parenting as well as law enforcement. I don’t care if a juvenile is 19 y/o or not, they need to be slapped with jail time and a fine imposed for parents. I hope she’s given the maximum sentence/punishment the law allows! And that she actually serves it in it’s entirety! These people go on to commit heinous crimes against people as well. Take Richard Andres for example. Yes, thanks for restating that Alfred. As you say, animal cruelty is very closely linked to cruelty to humans.